I have quite a few photographs from Flowerfield Celebrations in St. James, NY on this web site. Located in Suffolk County, Long Island it features a magnificent grand ballroom, a well-appointed bridal room, a private bar and lounge with it’s own fireplace and, arguably, one of the most expansive and unique cocktail hour rooms that you’ll ever set foot in. It is designed around an indoor free form Koi pond with a stunning bridge that spans from one corner of the room to the other. The grounds of Flowerfield are spectacular as well. Beautiful specimen trees line the outdoor ponds and a small island in the center is the perfect location for your outdoor wedding ceremony. I took this photo of the bride and groom just after sunset at a spot just outside the main dining room. 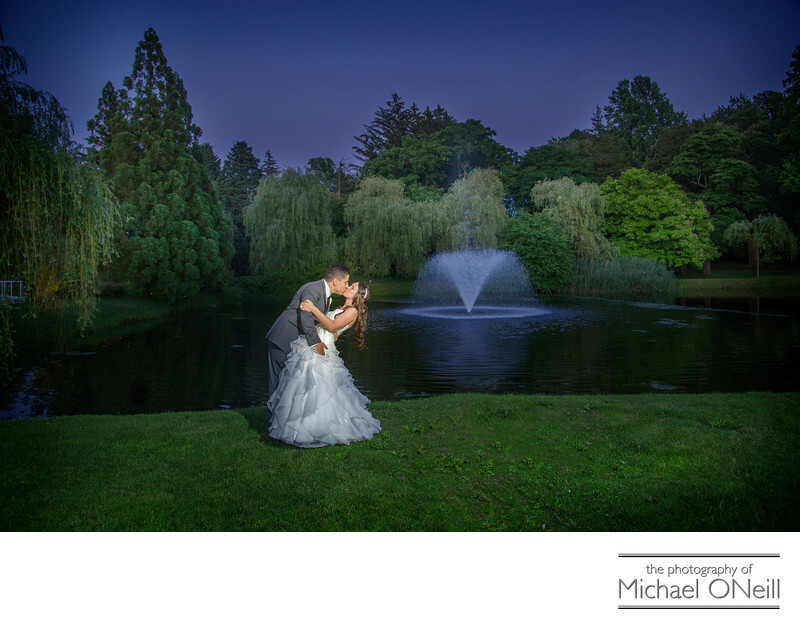 The pond, the trees and the fountain make up the perfect backdrop for this casual, modern wedding photograph. I have a great deal of experience working at Flowerfield which is located just 15 minutes from my East Northport, New York wedding photography studio and gallery. If you are planning a Flowerfield wedding celebration I urge you to call me at the earliest possible date. The calendars of Long Island’s best wedding photographers fill up fast. I would love the opportunity to discuss your plans and wishes for your big day.